As part of the review, stop times will be updated to accurately reflect the time needed to execute each route. This will help the department provide parents with accurate pick-up and drop-off times. Wilcots said he’d seen some routes with stops that simply were not feasible. He pointed to routes that were scheduled to pick students up from school at 2:50 p.m. and then make their first stop by 2:55 p.m. The goal, he said, is to ensure all scheduled stops are realistic and account for traffic and travel distance. But, Wilcots noted, even with the review and accompanying adjustments, unexpected delays — from unusually heavy traffic, road construction, or vehicle accidents — can still happen. Additionally, the department is re-instating four routes in the Lakeside Estates area in west Houston. 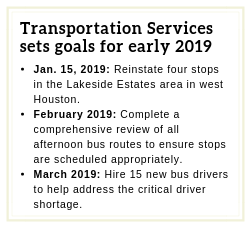 The new stops, which will take effect Jan. 15, will reduce the distance students must walk to get to their stop, decrease the number of students at each stop, and alleviate traffic in the area. Wilcots said he also is placing a renewed emphasis on recruiting bus drivers and has set a goal to hire 15 new drivers by March 2019. With 801 drivers and 878 routes, the department continues to face a critical shortage of drivers despite increased recruitment efforts, including multiple job fairs.